ST. ALBANS, Mo. (Aug. 2, 2017) – When you shatter an all-time Championship and course record of 61 the day before, the question is how in the world do you follow that? 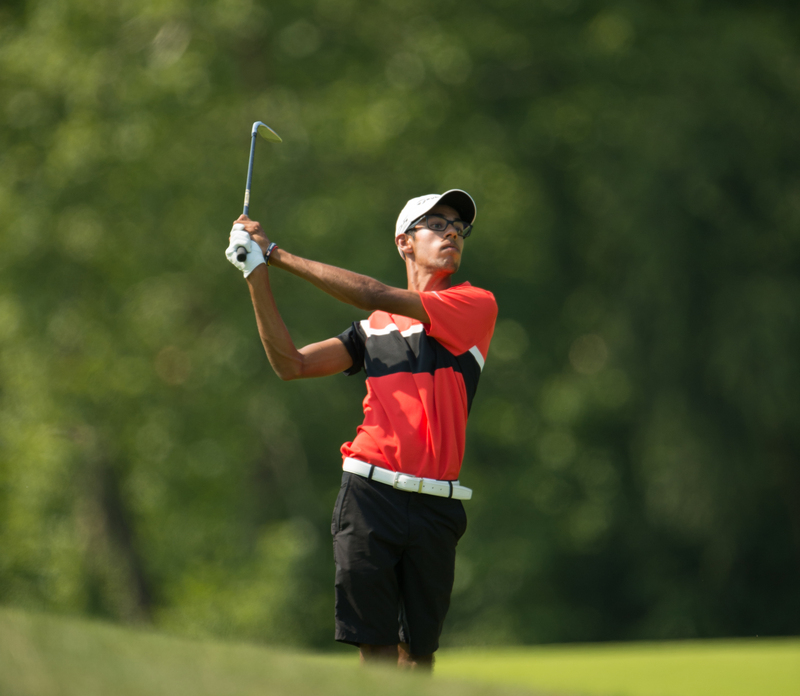 Well, for Akshay Bhatia, 15, of Wake Forest, North Carolina, the answer is to set a new 54-hole scoring record of 199, as he became the first person ever to break 200 in the history of the Boys Junior PGA Championship. The Championship was founded in 1976. Highlighted by a hole-out birdie from a greenside bunker on No. 15, Bhatia’s 3-under-par round of 69 (69-61-69 199) moved him into unchartered territory, as he heads into Thursday’s final round on the Lewis and Clark Course at The Country Club of St. Albans. He recorded five birdies and two bogeys Wednesday. Amazingly, one day before (on Tuesday), his scorecard showed an astronomical 12 birdies and just one bogey, including eight birdies on his first nine holes. With his record-breaking numbers, Bhatia stands at 17-under par for the Championship. Yet, he knows he is not free and clear. Just two strokes back is Daulet Tuleubayev, 18, of Cupertino, California, a native of Kazakstan, who moved to the United States four years ago. Tuleubayev (67-68-66 201) fired what matched the low round of the day, a 66, carding seven birdies versus just one bogey. Meanwhile, Tuleubayev was one of the top chess players in Kazakstan when he was eight-years old. He admits to using some strategy to keep within striking distance of Bhatia. In a tie for third at 13-under for the Championship, four shots behind the leader, are Trent Phillips (67-70-66 203), of Inman, South Carolina, and Reid Davenport of Austin, Texas (66-69-68 203). With six birdies on his scorecard, Phillips equaled Tuleubayev’s 66. Michael Barnard (70-70-67 207), of Gallatin, Tennessee, and Jacob Bridgeman (65-68-74 207), of Inman, South Carolina, are eight shots behind Bhatia, in a tie for fifth. Also tying for low round on the day was Will Thomson, of Naples, Florida, who stands in a tie for 14th place after a third-round 66. The Jack Nicklaus Trophy will be awarded to the champion at the conclusion of play on Thursday. For pairings and tee times, please click here. For more information, please visit JuniorPGAChampionship.com. Editors – Correction and Clarification: On Tuesday, Akshay Bhatia’s all-time Championship record 61 soley broke Brad Dalke’s record of 62 in 2015, and they share the 36-hole record of 130. Pat Perez (1993) and Chris Couch (1990) shot 63 in records that were held until 2015. Jordan Spieth (2008), Miguel Cabrera-Bello (2004) and Gordon Neale (2014) all shot 64 in their lowest rounds in the Championship. Dalke is the only player to shoot a 62 in the Championship, and Bhatia is the first to record a 61. Bhatia now also holds the 54-hole record of 199.